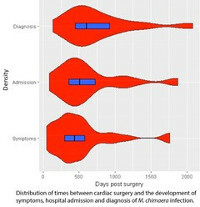 Mycobacterium chimaera infection following cardiac surgery has been reported worldwide. However, the spectrum of clinical disease remains poorly understood. To address this, Screven and colleagues reviewed 30 UK cases identified retrospectively through outbreak investigations and prospectively through on-going surveillance; they report clinical and laboratory features as well as treatment and outcome. The thirty patients identified exhibited a wide spectrum of disease including prosthetic valve endocarditis (14/30), sternal wound infection (2/30), aortic graft infection (4/30), and disseminated (non-cardiac) disease (10/30). The authors concluded that Mycobacterium chimaera infection following cardiac surgery should be considered in all patients who develop an unexplained illness following cardiac surgery. Don’t miss out on your chance to enrol in the exciting hands-on workshop, Better Methods for Clinical Studies in Infectious Diseases and Clinical Microbiology, to be held in Seville, Spain, on 7 – 9 November, 2018. New publication by the ESCMID Study Group for Antimicrobial Stewardship (ESGAP): Do European medical students feel prepared to prescribe antibiotics responsibly? The results of the ESGAP Student-PREPARE study have now been published in JAC. This large questionnaire study assessed self-reported preparedness among over 7,000 final-year medical students in universities in 29 European countries, on a range of topics related to responsible antibiotic prescribing. Most students felt they still needed more education for their practice as junior doctors. The patterns of preparedness on different topics were highly consistent across countries, and these patterns correlated with both overall perceived need for further education and levels of antibiotic resistance among common bacteria in the countries. Participate in a survey on shortages of antimicrobials and vaccines! Antimicrobial and vaccine shortages have been increasingly reported both in the U.S. and in Europe, and are probably going to become more and more common. ESCMID’s study groups for antimicrobial stewardship ESGAP and vaccines EVASG are conducting a survey to assess the impact of antimicrobial and vaccine shortages on physicians’ practices. You are encouraged to participate in the survey and to spread this invitation among hospital and community-based specialists. The survey will take less than 10 minutes to complete and can be accessed here. The study groups plan to present the results at ECCMID 2019 and use them to provide guidance on antimicrobial and vaccine shortage management. Country-specific data will be provided to interested researchers. ESCMID has started to prepare the scientific programme of ECCMID 2019. The first phase of this process was the submission of proposals in which ECCMID Programme Committee members, ESCMID Study Groups, EUCIC/EUCAST, Affiliated Societies and several external partners were involved. We received 386 proposals representing all session types and categories. We warmly thank the proposing entities and the co-organizers for their contribution. In the coming weeks, the ECCMID Programme Committee will review and evaluate the submitted proposals and prepare the final programme by July/August 2018. The Global Antibiotic R&D Partnership (GARDP) has created REVIVE to connect and support the antimicrobial discovery, research, and development community. GARDP is starting a REVIVE webinar series to share the real-life experience of experts in antimicrobial drug R&D. On June 13, David Shlaes will give a presentation about ‘Antibacterial drugs: Clinical development for non-developers. Part 1: Traditional development – tiers A and B’, followed by an interactive Q&A session. In this webinar, David Shlaes will introduce the relationship between the discovery phase and later clinical development and also discuss traditional clinical development pathways (tiers A and B) focusing on non-inferiority trial design. Register here to join the discussion!